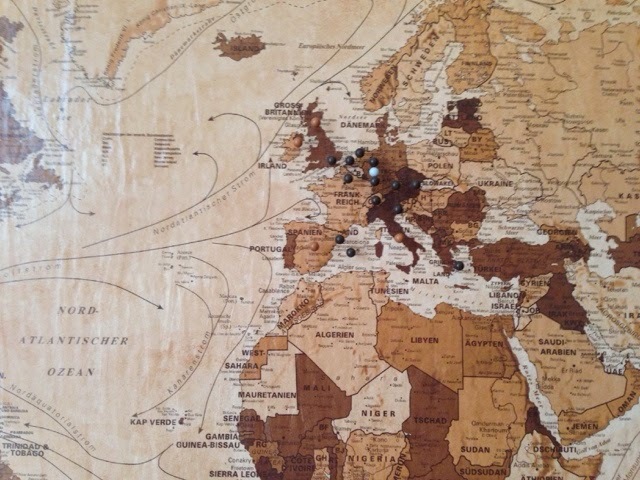 If you love to travel and explore, then a push-pin travel map will complete you. 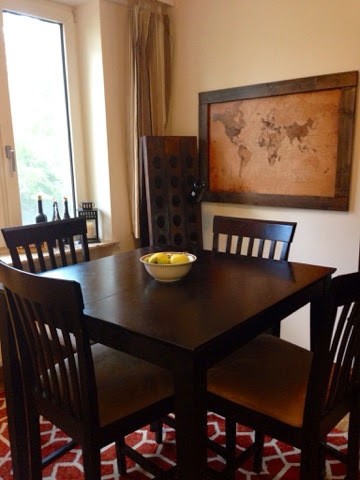 Ours is located in the dining room, and I can't tell you how many times we've spent the whole dinner conversation discussing our past and future travels or just in general where certain countries are located (geography just isn't my thing). 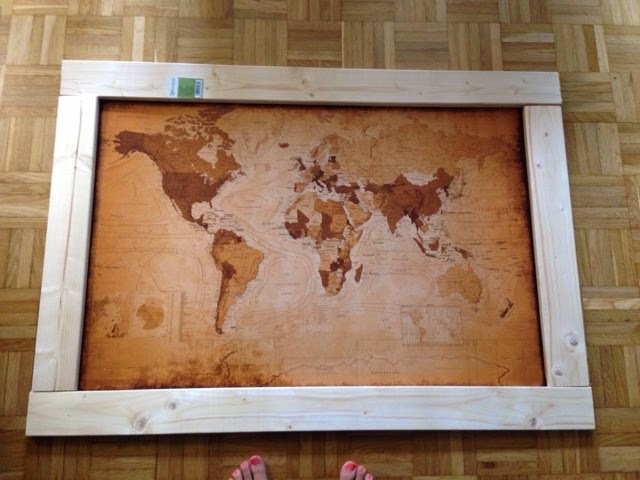 A travel map is a great way to see where your feet have touched this vast Earth. It also helps to realize how much of the World you haven't seen and how large it actually is. 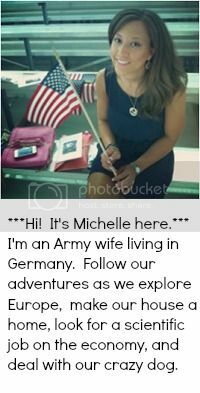 We are so blessed to be stationed in Germany during this time in our lives and have the opportunity to visit such amazing places in a short amount of time. We also have the travel bug and have made a marriage pact that we will travel when we move back to the States. We're a bit embarrassed to admit that we haven't seen some of the greatest places in the USA (Boston, New Orleans, Maine, and Portland to name a few). 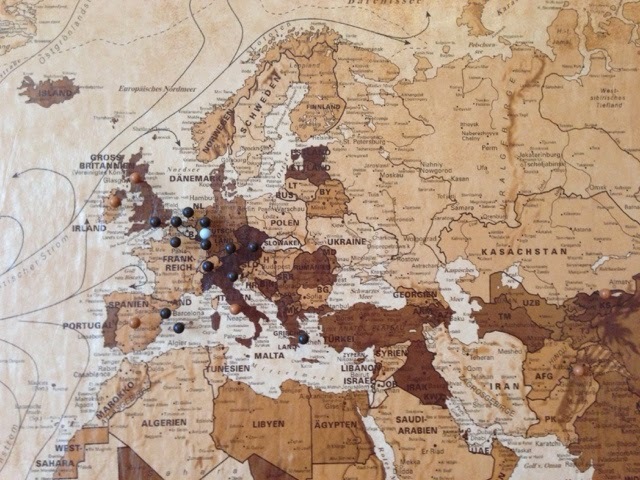 I searched the internet for a push pin travel map to buy and found one from National Geographic, but since I have so much time on my hands and love DIY, I thought I'd attempt making one myself. If you don't have the time and want a professional looking map the National Geographic one is a great option. If you want to make a map that is unique to your family, I found some great tutorials on how to make one yourself. I had been contemplating following the tutorials and purchasing my map online, when Sam saw the perfect map in a local store here in Germany, NANU-NANA. I fell in love with it when I realized that the countries were all in German (It also helped that it was 6 Euro, score)! One of my favorite parts of Deutsch class was learning the different spelling of other countries, like Jamika, Island, and Kanada. What a great souvenir to take back with us after our tour is over! If a Deutsch map isn't for you, you'll surely find one on amazon that suits your family. 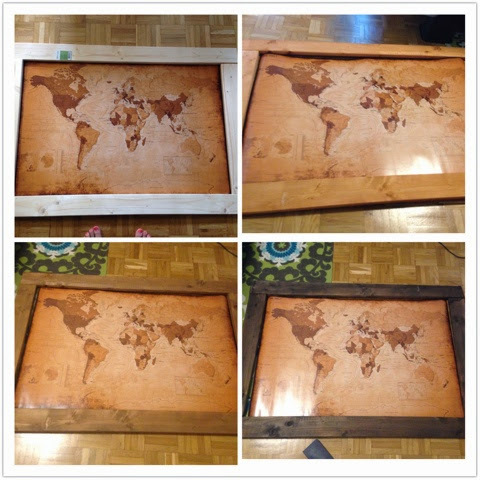 Turns out there are a lot of DIY travel map tutorials out there on the interwebs (shocker, I know). I used this tutorial to make mine. She was working with the same type of glossy poster that I worked with, and I was happy to see that the Mod Podge Matte (not glossy) gave it an antique look. Mod Podge is a bit tricky to work with, but don't be discouraged. Your map will bubble during the process, so don't freak out and trash your map in frustration while proclaiming you are giving up DIY forever (been there, done that - with another project). I have my pictures below of the before and after. If you don't have a sheet of cork board like the tutorial above, I ended up using square cork board pieces instead and it worked out great. 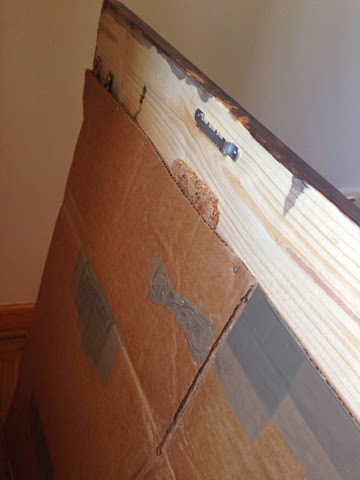 **Step 1** Get a piece of cardboard, thick foam board, or plywood to use as a backing. I ended up using an old moving box, since this is going to be hung on the wall (a piece of plywood might be too heavy and a moving box is free). 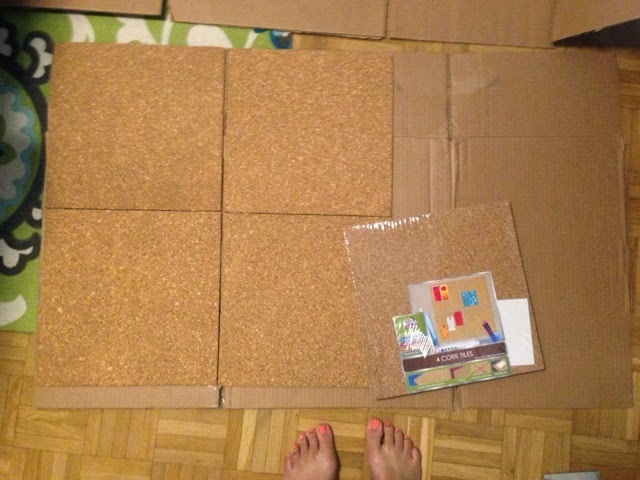 Glue your cork board squares (I found some at the PX) to the cardboard. I used regular old white glue they use in grade school. I was nervous the lines from the squares would show through, so I made sure to get them as close as possible to each other. Put Mod Podge on the cork board. 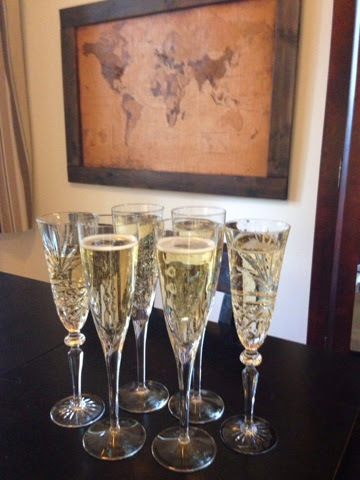 It will start to soak into the cork, and you want it to feel a bit tacky before laying your map down. Try to lay your map in the right place on the first try, and don't try to re-situate the map if you see bubbles, they're inevitable and will go away after it dries and sets completely (up to 48 hours). 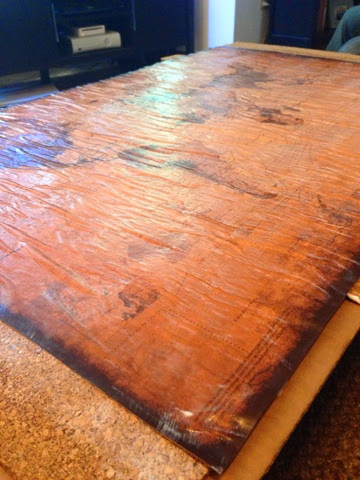 Next apply two coats of Mod Podge on top of the map, allowing it to dry in between each coat (30 mins to 1 hour). Here is the final map. See, the bubbles are gone! 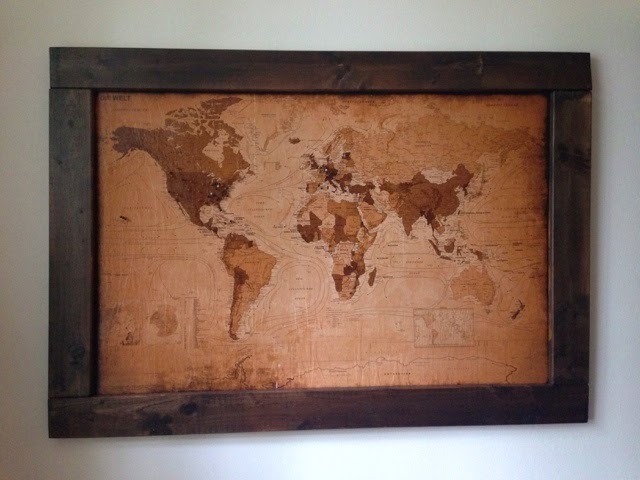 There are a few creases, but I think if I would have not skimped on the Mod Podge or tried to pull my map up because I didn't lay it down in the right place, it would have had less creases. Honestly, I think that the creases from the bubbles actually help add to the antique character of this map. I also like the effect that the Mod Podge Matte gives my map. The glossiness of the original poster made it look less antique. All wins in my book! Next you can take this in to your local frame shop (Hobby Lobby in the States or the Art's and craft Center on post in Germany). 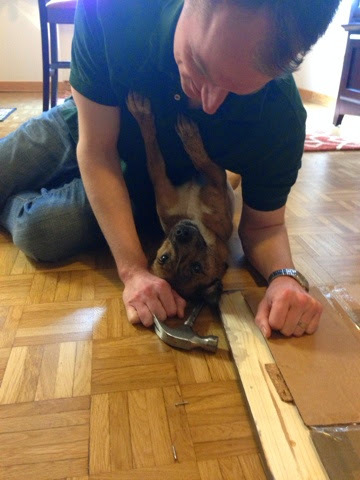 Actually, the frame shop on post will mount it to cork board and frame it for you if you aren't that in to DIY. Don't bother looking for a frame on the German economy. I searched high and low for a decorative poster frame with no luck. OBI and Hornbach all had poster frames that were thin and cheap looking, while Ikea just didn't carry the normal 24 x 36 poster frame size. I was dying for a Target at this point because they have some great options at reasonable prices. Recently I found out about the store Globus here in Germany, which is supposed to be the closest thing to a Target...I can't wait to check it out! Maybe you'll have luck there? 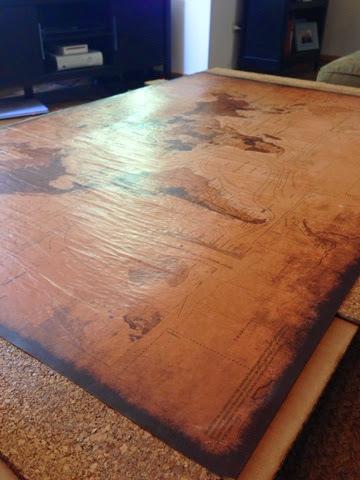 In the end I'm glad that I didn't go that route because I came across a great tutorial on making your own poster frame out of 1 by 4's, and it goes great with the antique look I was going for with my map. I went to Hornbach (for those of you who live in Germany) and they were nice enough to cut the wood for me in the correct dimensions for a 24 x 36 poster (2 pieces of wood at 42 inches and 2 pieces of wood at 23.5 inches). Side note: make sure to not be overwhelmed by being a female in the hardware store in Germany and pick the first board you see that happens to be warped...it leads to problems. My father taught me better than that, but I couldn't muster up the courage to ask for a different one when I noticed it as the guy was hand sawing the board because the electric saw machine was down. It's okay, more of a challenge, right? 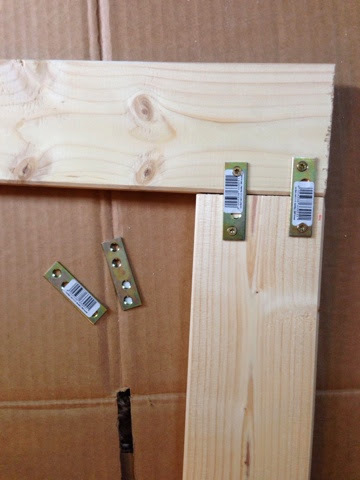 Once you have your pieces find some hardware to attach the boards together and you have a frame! Too easy peasy, right? Obviously, you can go and buy any stain at your local hardware store if you want to take the easy way out (or if you're smart). 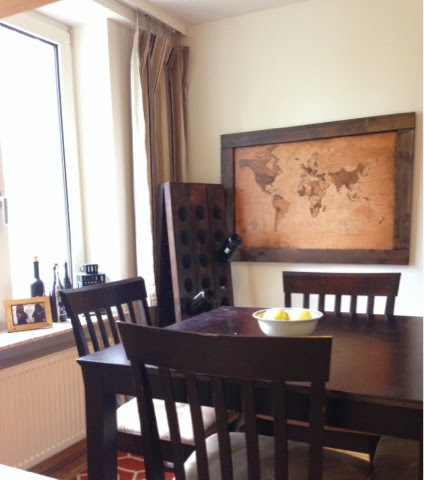 I wanted to make this an epic DIY project, so I went ahead and tried the tea staining process. 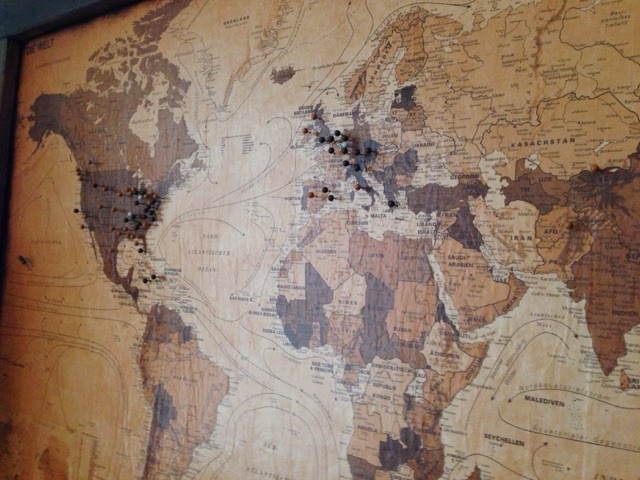 The tea stain was gorgeous, but unfortunately the stain matched the color of my map. Through searching endless DIY stain tutorials I found out that soaking steel wool in vinegar for 24 hours brings out the tannins in the tea, and creates a much darker stain. This tutorial shows how different woods react to the stains. 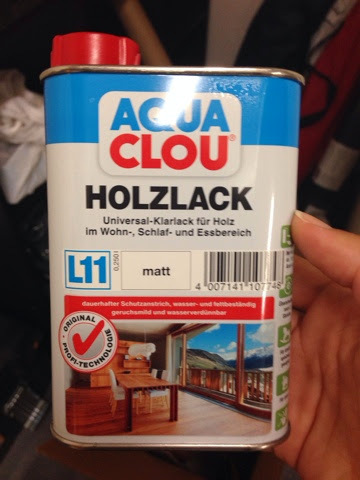 I'm not sure on the type of wood I found here in Germany, but my experience is below. **Step 1** Take 3 black tea bags and 3 cups of water; Boil it and reduce it to 1/2 a cup. This will be a thick consistency. I applied four coats. I let the wood dry in between, so it wouldn't get soggy. Make sure to let the stain sit overnight to let the full color show, and then decide if you need to darken it more with a steel wool vinegar stain. **Step 2** Take steel wool (grade #0000) and break it up into pieces. Place it into a glass jar and cover the steel wool with vinegar (1/2 and inch to an inch). I used regular household vinegar. Let it sit 24 hours. I just set the lid of the jar on the top of the jar and set it in a well ventilated area near a window. I could't wait 24 hours and tried it after 12 hours. The one coat didn't stain it dark enough, so I did another coat after letting the steel wool vinegar sit for a full 24 hours. It darkened the wood much more and came out gorgeous! Moral of the story, be patient and follow your tutorial (when will I learn?). 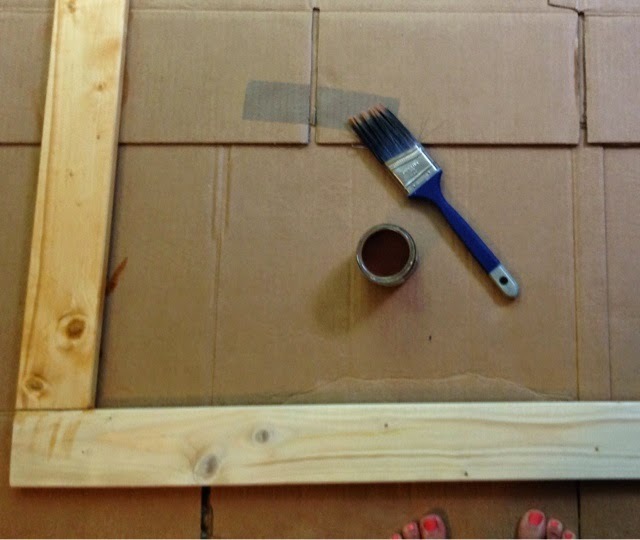 **Step 3** Add a coat of stain wood sealant or top coat in matte. I'm not actually sure what I bought at the German hardware store, but I loved how it came out! 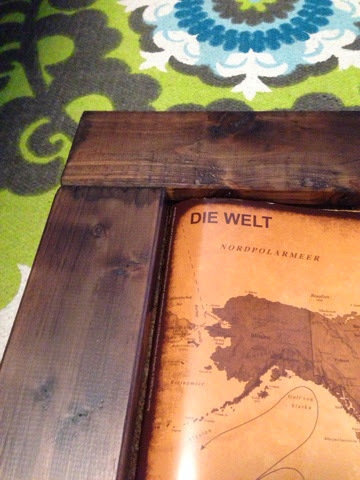 Lay your stained frame face down and position your map, that's attached to your cork board-cardboard creation, so it is centered. 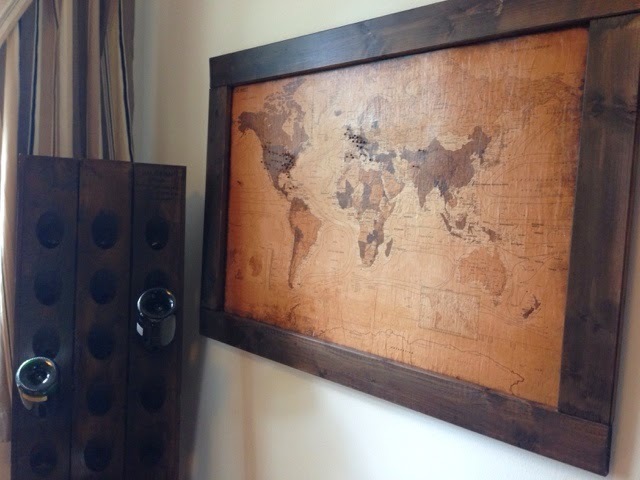 Grab some small nails and secure the map to the frame. We did one every 6 inches or so. Find some picture hanging hardware and add it to the frame. I used two pieces of hardware, since it's a large frame. My favorite helpers! Emma says we're all work and no play. I found pins on amazon, here. These 1/8 inch map tacks are shorter in length than sewing pins and have a small diameter. They come in all colors, and they shipped to our APO address within a week (I was dying to start pinning, so this made me happy)! 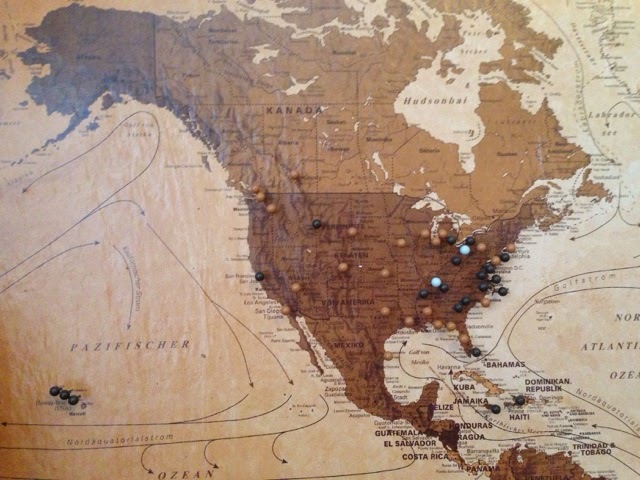 I chose gray, chocolate, and brown to go with my antique style of the map. Choose a pinning scheme that works for your family. We chose a color for where we've lived together (the Army likes us to have several places we call home), where we've traveled together, and where we've traveled apart (we couldn't leave out Sam living in the sand for 9 months and our map looked like we had never visited the major cities in the USA even though we had both traveled to them, just not together). Voila! Or "hier" if we're sticking with our German theme (not fancy enough though, right?). A perfect addition to our home. Thanks Jenn!! You can totally do this and pin the heck out of South Korea!